19BOX RECORDINGS brings you two new funky/disco house tunes. After debuting with his remix of VALID EVIDENCE’s “Sound Of Blue”, BLUE SATELLITE has returned with a brand new original. His debut single is titled “Paris,” and pays homage to the city of Paris. Included in the single is a remix by FUNK MEDITERRANEO, two Italian djs/producers born in Sciacca. They are bringing a classic house spin to the original. 19BOX RECORDINGS brings you two new funky/disco house tunes. After debuting with his remix of VALID EVIDENCE’s “Sound Of Blue”, BLUE SATELLITE has returned with a brand new original. His sound style described as American answer to France’s JUSTICE and brings an Ed Banger vibe with his fusion elements. His debut single is titled “Paris,” and pays homage to the city of Paris. 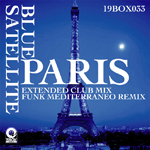 Included in the single is a remix by FUNK MEDITERRANEO, two Italian djs/producers born in Sciacca. They have released tracks on LINGO, CLEAN HOUSE, DIGIFUNK, CLOSE UP, PHOBIC, MUSIC TASTE, BAKER STREET, ROUND HOUSE, MIDWEST HUSTLE, BLATT TRAXX, SERIAL SICKNESS and many others. And this time, they are bringing a classic house spin to the original. You may think these are different from the usual 19BOX style but we are proud to say that “we are bringing you another fresh addition to our collection of quality house music”. Just in time for the debut album release "Phuturefunk", DJ 19 joined forces with japanese top club download sites, KINGBEAT & WASABEAT to do a remix contest for a track from it. We are looking forward to your creative ideas...no rules, just good music...whatever you want to make of the song: House, Electro, Techno, Trance, Ambient, Hiphop, Chill, Pop...go for it ! -All remixes must be submitted by November 30th, 2009. No Exceptions!